Checks to purchase gift cards can be written to the Miami Dadeland Pinecrest Foundation,which is tax deductible, and mailed to Treasurer Nancy Brown, CPA, 7700 N. Kendall Dr. Suite 200. Miami, FL 33156. Items may be dropped off at the Pinecrest Community Center located at 5855 Killian Dr. or Sunstate Bank located at 14095 S. Dixie Hwy. until Thursday, May 21. 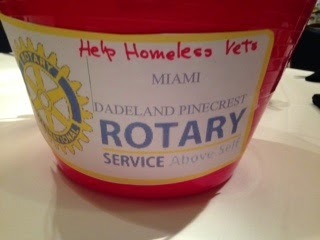 Rotarians will be accepting donations in the lobby of the Datran Center on Friday, May 22 from noon to 2 pm.